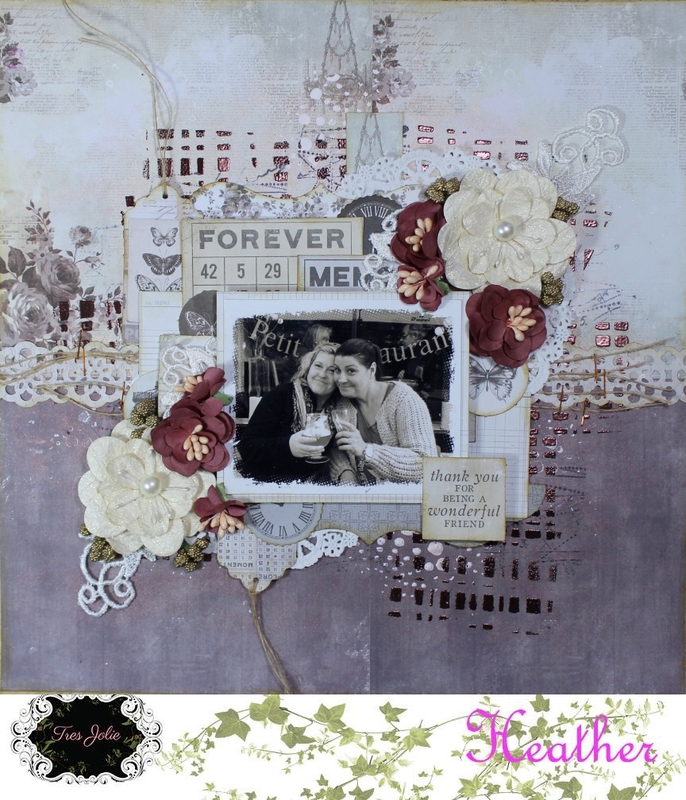 A monthly kit club that specializes in shabby chic, elegant, romantic kits. Rae made a couple of cards, cutting out that darling little deer for the focal points of the cards. And Rae also made this fun tag set, focusing on the red and blue color combo with those papers. The card/tag kit has plenty of paper for all kinds of small projects. Even after you use up all of the embellishments from the kit, you will have paper left over to use with your own embellishments! It’s a great deal! And, we still have a few kits available, so be sure to snag one HERE, if you haven’t already! Thanks for taking time to check out the blog today! For details on subscribing to these monthly kits follow the link below. This little shadow box is made with scraps of the Maja Design paper, and the amazing Creative Embellishments holly frame. 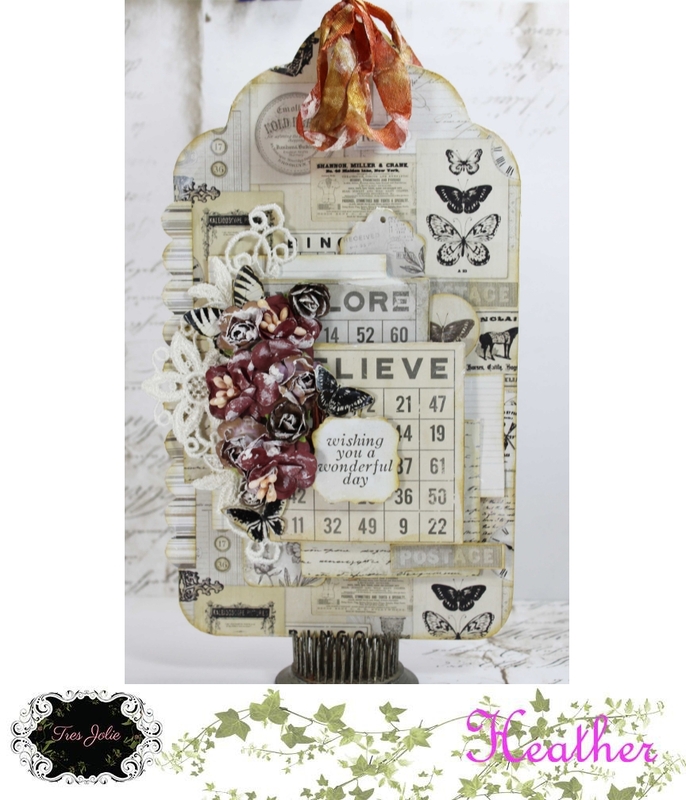 I used one of the boxes from the Tim Holtz vignette box set and one of his metal stands, both from my stash. I covered the box with scraps of the red Maja paper that I cut to size, distressed, and inked with brown ink on the edges. Then I cut the red border away from the picture of the Santa, so it would fit in the box, and what do you know? That border was the PERFECT size to the front of the box, so I inked that and glued it on as well. Once all the paper was glued to the outside of the box, I added some white gold wax paste to the edges. I also added some of wax paste to the metal base that I already white washed with gesso. After I distressed and inked the Santa picture, I glued inside the box. I used Stampendous aged green embossing powder on the Creative Embellishments holly frame, then added some of the white Kaisercraft pearls to the small circles. TIP: I always use a heat tool on my pearls after I have place them on my project to heat up the glue- if you press the pearls down when the glue is warm, it will really stick! There’s need to add extra glue or Glossy Accents to each of the pearls if you do this! Lastly, I added a title cut from one of the bottom of the Maja papers, and added a red poinsettia from my stash. Thanks for stopping by the blog! It’s time to start making tags, if that’s something you do for Christmas! 🙂 Today I am sharing a few tags I made with the December Cards, Tags, and More kit. 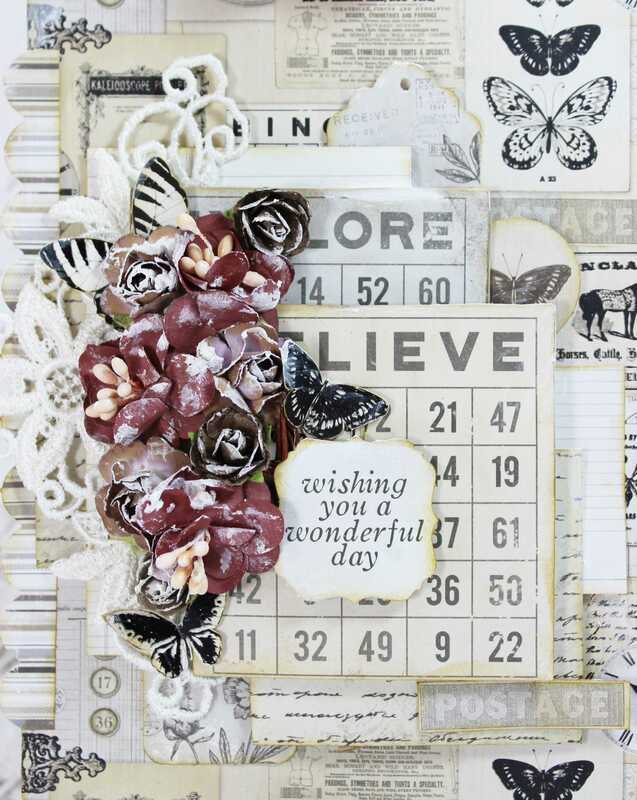 My inspiration for creating this tag trio was the Creative Embellishments chipboard set that came in the kit: Peace Love and Joy titles. I kept the design mostly the same for all three tags: I hand cut some of the red cardstock from the kit to make tag shapes, and then cut some of the Mintay Christmas Stories papers slightly smaller for layers for the base of the tags. I distressed the edges of both layers, then inked the edges of the patterned paper layers. I also cut out doilies (Prima) from the Mintay papers- one for each tag. I also cut out some leafy swirls using a Cheery Lynne die. I cut those and added them to peek out from under the Kaisercraft flowers. Under each of the pieces of chipboard, I added three little cut outs from the Mintay paper and fanned them to give a nice base for the chipboard titles. 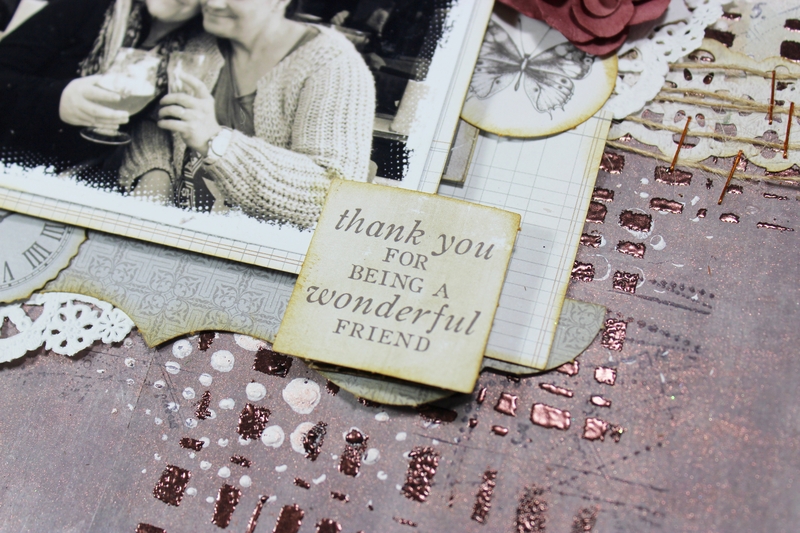 I treated the Creative chipboard pieces with some white and gold embossing powders. Hello! Today I am sharing a couple of cards I have made with the December Card, Tags, and More kit, featuring Mintay Christmas Stories papers. I created two 6X6 cards using a similar design. I love that cute little deer on the papers, so I cut two of them out for these cards. This paper is perfect for fussy cutting! I also cut out some of the red poinsettias as well to add to the floral part of the cards. I used a 6 X 6 piece of paper for the back layer of the cards, then cut two sheets of the 6 X 6 paper down to 5 3/4 X 5 3/4. Then I ripped the paper that was going on the bottom diagonally to create a “half and half” design. I distressed all of the edges, then glued these layers together, leaving room under the top layer to tuck in some lace (from my stash). Next, I added some stenciling (snow “dot” pattern) with some glittery paste, and added the Merry Christmas titles. On this card, I used the red paper and a die to cut the title, and added some of the Kaisercraft pearls to accent the title. 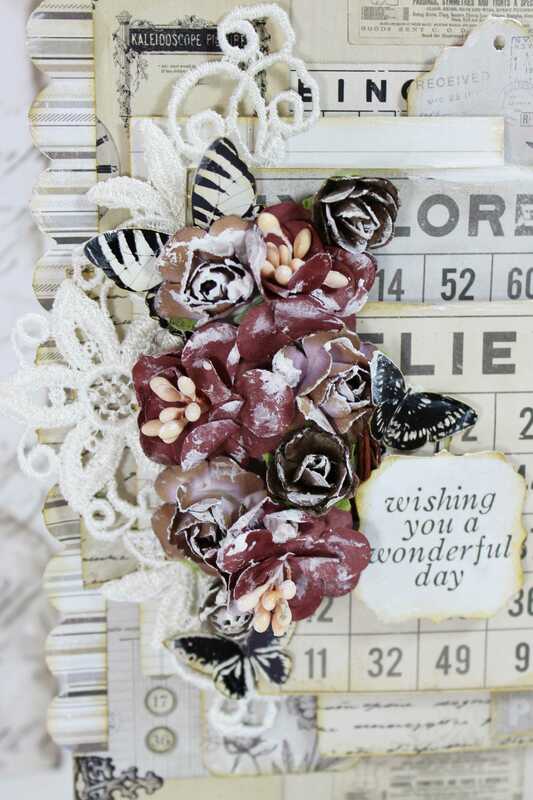 For this card, I added the Creative Embellishments chipboard from the kit. I embossed it with Stampendous Shabby Green embossing powder from my stash. I cut out a fancy snowflake with an old Memory Box dies, and put it in the middle of the card, then added a larger flower from my stash, added the deer to the middle and added some of the small Kaisercraft roses from the kit. After that, I tucked in the poinsettias that I fussy cut, then added more of the little Kaisercraft roses. Here’s a couple of closeups from both cards showing the floral cluster/line. Thanks for stopping by the blog! Keep checking back all month to see what the rest of the design team has made with all of the kits! Today I’m sharing more cards that I made using the card kit featuring the Prima Marketing Havana collection. I LOVE the colors! So I made two cards very similar in the way that I designed them. This first one is a 6×6 square, so it’s rather large. I started with cutting my layers- the Kaisercraft cardstock is slightly darker, completely complimentary to the greens in the Havana papers. The white layers are die cuts- I used the Kaisercraft border die from the kit, and a floral die from my stash. I added faux stitching to all of the paper layers with a sewing wheel, paper piercer and fine tip black marker, which you can see clearer in the closeup below. I added some pretty crystals from my stash, as well as some black and white splatters of India ink to complete the look. The chalk inks I used were Tsukinedo Dew Drop in Ocean Oasis, and the pink is Old Rose from Prima Marketing. Here’s another card I made using the same design concepts, but I added some die cuts from dies in my stash. 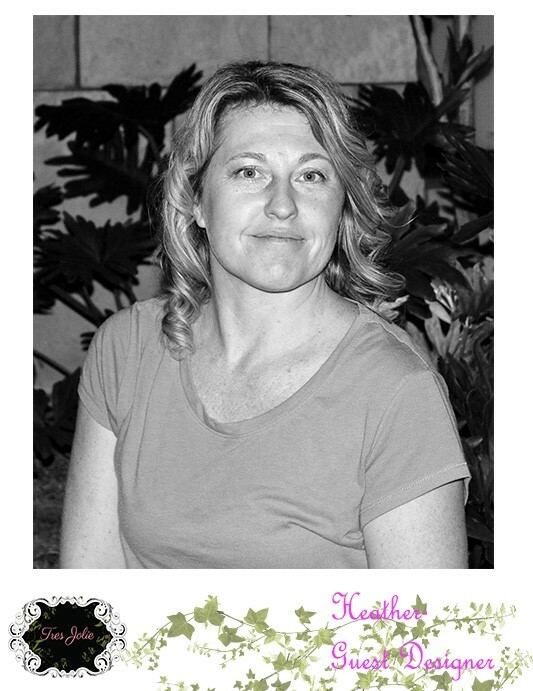 Thanks for taking the time to stop by the Tres Jolie blog today! We still have card kits available to purchase HERE. You can purchase kits from this month, and subscribe for next month! Both cards were made using the same design. I started with two layers and added some distressing and chalk ink from my stash. The green is a Tsukinedo Dew Drop ink pad in Ocean Oasis, and the Pink is the Prima Old Rose one. I used both chalk inks on the tickets, banners, and the green on the Kaisercraft wood doilies as well. I added some a doily and some floral die cuts that I cut from the Prima Havana papers. I also added some Dusty Attic chipboard coins (“Smile” on this card, and “Cherish” on the other one.) from my stash. I wanted them to look like pennies so I added some copper wax paste and the green chalk inkl. To finish off the cards, I added some black and white splatters of India ink. Here’s the other card- same design, just different papers, and slightly different elements. Thanks for stopping by the blog today. I hope you get a chance to play along with us this month. Details here in the Facebook community. We do have a couple of August card kits still available here! Enjoy the rest of your weekend! Hey everyone, it’s Kim. Today I am sharing the cards I made using the card kit and the sketch. I have to say, I’m not the best with cards, so it was good to have a sketch to follow. I’m not sure how that works though. I can create a sketch, but can’t create a card from scratch. Oh well, moving on. There are still few kits available. You can do a single purchase here or you can subscribe here. Here is the card sketch for the challenge this month. Make sure you join in on the fun. Post your entry for the card challenge in our Facebook Cafe. You don’t have to be a kit subscriber to enter, just please don’t enter using products from another kit club. Here is that pretty die and my flower cluster. I used the banner tag in the cluster for my sentiment instead of on the bottom. For my center image on this card, I used the die cut twice and added the wood doily as the main piece. Then I added smaller flowers to accent it. I love the bakers twine in the kit. The colors are perfect for this bright summery card kit. Plus there is plenty of card stock to make several cards or tags. That’s all I have for today. Thanks for stopping by. 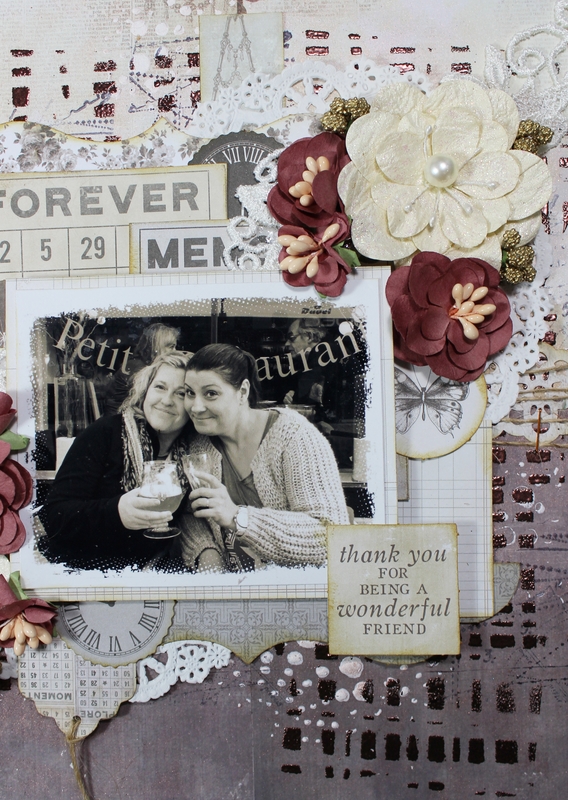 I made another fun page from our recent trip over seas with the card kit, so many more things you can make than just cards, why not a full layout page. This is a photo from our trip overseas, my great friend Laneen and I eating at a little sidewalk cafe along in the wonderful city of Arnhem. These are truly forever memories. Here are a few more close-ups. I hope you enjoy~! Thank you for stopping by today! 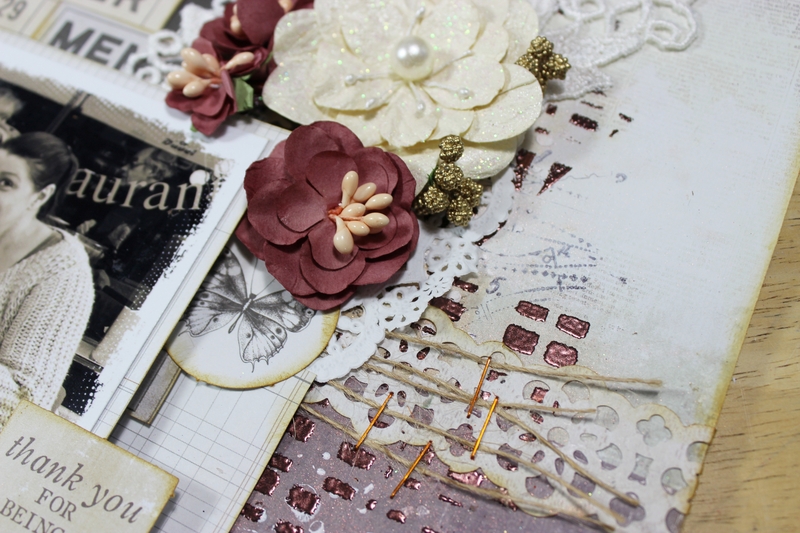 Today I’m sharing a layout I made for the Mood Board Challenge using the July kit. I chose to use some of the Lemoncraft Violet Silence paper that had pink flowers on it to coordinate with the hot pink Kaisercraft flowers. I was inspired by the polka dot fabric in one of the mood board pictures, so I repeated the use of circles by adding a circle stencil, a doily, a piece of Lemoncraft flair, polka dot paper, and adding dots to the chipboard frame (from my stash) and some purple and green berries (also from my stash). I tore apart the 49 and Market ivory flowers and added the Kaisercraft hot pink flowers to make those pink flowers POP. I also added some pink chalk ink to the ivory flowers. This closeup below gives a good view of the paper layers, and shows how the flower cluster and leaves, as well as the pink lace chipboard are a contrast to the softness of the hues of the papers. The frame under the picture is a Dusty Attic chipboard frame from my stash, but really, any oval frame would do the job here. I painted it white, added some purple pigment ink for a distressed look to blend with the papers, and added accents with the Nuvo drops from the kit. If you haven’t had the chance to try Nuvo drops, you NEED to! They are self-leveling, so they will dry dimensional, but not uneven. Thanks for stopping by the blog today! 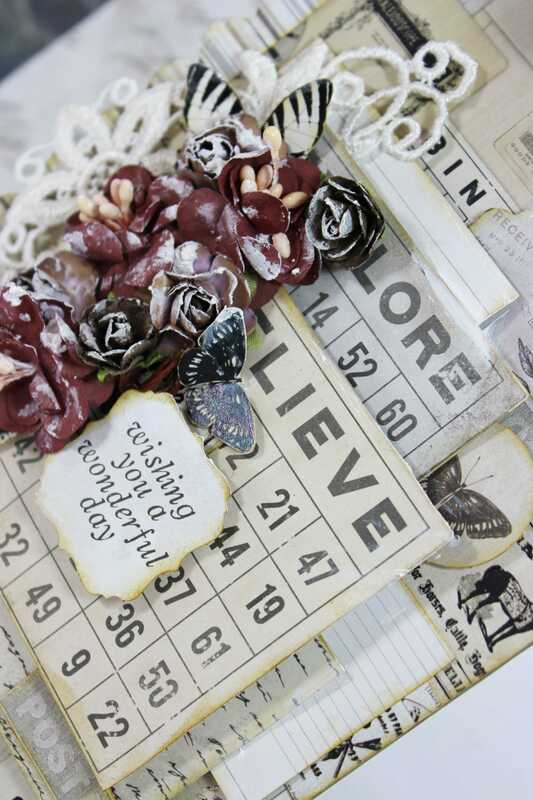 I hope you get a chance to join us for the mood board challenge! You do not have to be a subscriber to join the fun, but if you wanted to use the July kit, there are still some available HERE. Using the Kaisercraft paper pack from the card Kit I made this large vintage tag using the large tags from Creative Embellishments . Lost of layers and and some softening of the flowers and I got a vintage look I was aiming for. Using various products from the card kit, and the Kaiser Craft Paper Pack, I cut elements out to add to the tag. Here is a video for you to see how this all came together.